Rose Tremayne is aged sixteen years and ten months. She is a British student at a college in Henley. She also has Down’s syndrome. Her boyfriend Jack also attends the same college, in a specialist unit. Jack had a brain injury when he was very young, leading to difficulties in literacy and anger management. Jack is involved in a dangerous episode. He loses his temper with a teacher. He throws a chair, which breaks a window. The teacher gets a shard of glass in her eye. Having been on the brink of dismissal from the college, Jack is now sent away to a residential treatment centre in Brighton. Rose is distraught at Jack’s absence. She decides that she will set out to find Jack and bring him home. 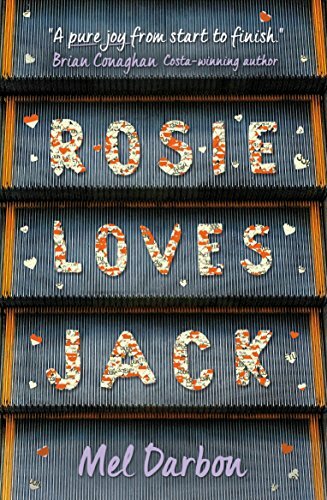 The biggest problem attaching to this plan is that Rose’s father disapproves of her relationship with Jack. He doesn’t believe Rose is ready for a serious relationship, least of all with someone as volatile as Jack. When Jack sends Rose postcards from the treatment centre, her father intercepts them and conceals them. The question now is whether Rose can find Jack and (as she sees it) rescue him? And if so, at what cost? It is a rarity among books for young readers to find a narrative recounted in the first person by a disabled character. Offhand this reviewer can think of only a handful. On the whole, Darbon’s book is a praiseworthy effort. But there are problems. As part of her impairment in the book, Rose herself also struggles with literacy, which limits the scope of the text. At a few points, it strains credibility that Rose manages to express herself as fluently as she does. Nevertheless Rose’s voice is quite distinctive. Once the reader has become accustomed to her style of construction, as with regional or national dialects the reader becomes habituated. The most important accomplishment of Darbon’s novel is that it tackles head on the contentious issue of sexual exploitation and disability, in a highly dramatic context. Most writers by default see disabled people as asexual creatures. Recognising this issue is important both for disabled and non-disabled people, forming as it does a significant element in a wider context of marginalisation. Read our interview with Mel Darbon.